Thanks to people leaving, moving and catching lurgy we were really short of players – what a come down from a few weeks ago when we had two parallel games and were struggling to find chairs for everyone! For this reason, we abandoned the “Feature Game” (Sushi Draft! 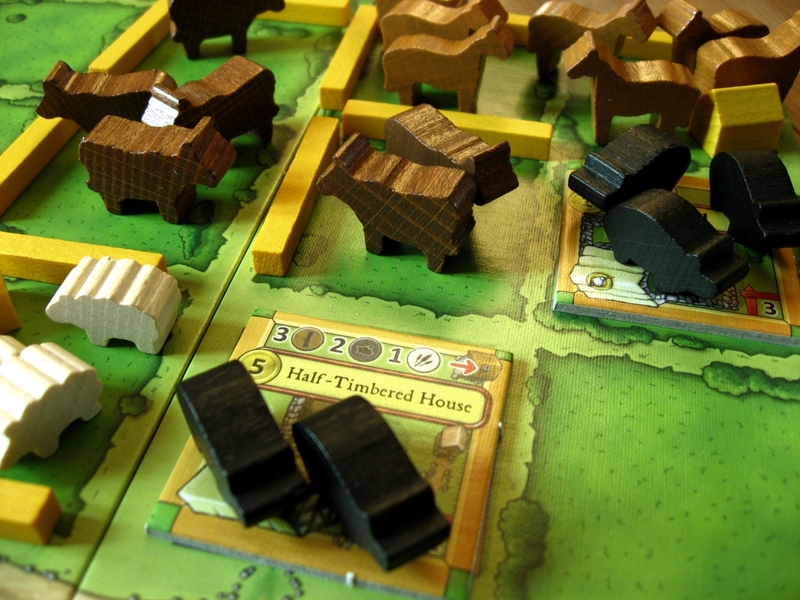 ), as it plays better with more people and started out with a quick game of Agricola: All Creatures Big and Small. This is a smaller version of one of our more popular “worker placement” games, Agricola. 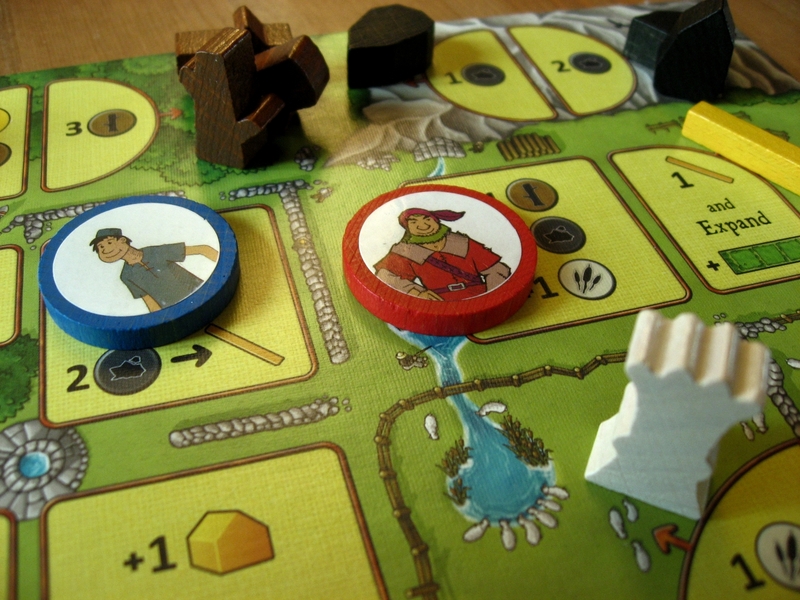 In this game players are medieval farmers and the idea behind it is that players start with a small number of workers and carry out actions to build up their farm by fencing off pasture, buying animals, ploughing fields and growing corn and vegetables, all the time trying to make sure that workers have enough food. At the end of the game, players score for a range of things including how large their house is, and how big their family is. In the smaller version, the focus is concentrated on the animals and players primary aim is to develop their stock with a secondary aim of expanding their property and making good use of the new land. In general, a lot of the basic rules are the same: You collect resources to build anything and your animals must be kept in an enclosed space (either a building, tied to a drinking trough or in a fenced pasture); any animals that you have more than two of will breed at the end of the round to give another. In contrast to its big brother, in this game there is no facility for increasing your family from the three you start with, there is very limited facility to upgrade your cottage, food is provided by some other means outside the game (clearly the workers are not going to starve), and minor/major improvements and occupations are provided by buildings. We had played this before (though not on a Tuesday), so we included four random buildings from the expansion, More Buildings Big and Small, specifically, the Ranch, Dog House, Rearing Station and Barn Floor Manufacturer. Red started and began collecting horses, meanwhile, Blue built a Dog house that allowed her to keep one sheep in each unfenced pasture not adjacent to the forrest. Red then built a stall and some feeding troughs and started breeding horses and pigs while Blue tried to expand her property and built a Ranch as the flock of sheep carried on growing. 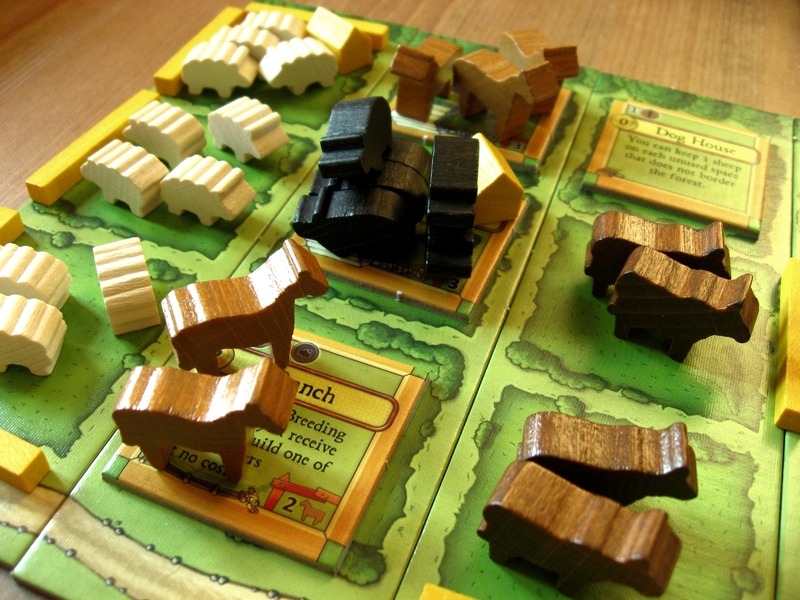 In the dying stages of the game, Red managed to gather together enough sheep to avoid a penalty, but failed to completely cover his second expansion board; Blue had to allow a couple of animals to escape as she couldn’t find space to house them despite completely covering all three of her expansion boards. Blue ran out the winner with 51 points to Red’s 43, largely thanks to her large flock of sheep. Next, we played Tobago, which is a Christmas game that we’d played before (though again, not on a Tuesday). This is a very beautiful game of treasure hunting on the island of Tobago. The board is divided into segments of different terrain, forest, beach, mountain, river etc. The idea is that players take it in turns to play cards that successively narrow down the location of the treasure. Thus, if the first player plays an “in the forest”card, the next might play a not “next to the river” card reducing the number of available spaces that can hold the treasure to those wooded spaces out of earshot of the river. Each player also has an All Terrain Vehicle (ATV) that they can move instead of playing a card, and use to collect treasures. When an ATV arrives at the treasure space (or the treasure location is unambiguously revealed as a location where there is a vehicle), treasure cards are revealed to the players, with one per card per clue and an extra for the player who found the treasure. The cards are then pooled, shuffled and the top one turned over. The last player to place a clue card gets first choice of and can either choose to take the card, or pass (waiting for the next card), and let the next player choose. Each treasure card has a different value and as players who placed a lot of clue cards will have seen a lot of them, they are in a better position to decide whether it is a good idea to take a treasure or to pass, the more so since there are two “cursed treasures” which prevent any further treasures being revealed as well as causing players to discard their most valuable treasure card. Once the treasure has been distributed, amulets are distributed around the island; players who collect these can exchange them for an extra turn or use them to prevent treasure loss when the cursed treasure is revealed. Red placed his ATV in the middle of the island next to a lake, so Blue placed hers on the other side of the water and immediately realised that Red had the optimal position. Red started laying clues, so Blue carefully stalked him matching every clue he placed. The first treasure was located in such a way that Blue could make it there first giving her the majority of treasure cards. Placing second meant that Blue had first choice and was able to keep the most lucrative treasures. This pattern was repeated for the first few treasures and Blue managed to get a nose in front. Red made tried to collect amulets so he could regain control of the game, but the final damage was done when the cursed treasure cards appeared and in both cases Blue collected more treasures than Red. As the game came to an end, Red had amassed a fine collection of amulets, but it was too late to make a real impact and Blue won, 73 points to 43. The last game we played was Morels, which we’ve played before, but was new to one of the players. This is a fairly traditional set collecting game, but is a very nice rendition with lovely art-work and some hand made forage sticks provided by the designer. The idea is that you can collect the readily available mushrooms “at your feet” for free, or you can choose a less accessible fungi and pay the difference in forage sticks, the game’s currency. Once you have a set of three or more mushrooms you can cook them, and add cider or butter if appropriate to add extra points at the end of the game. Red started again as he hadn’t played it before and made a point of collecting some forage sticks by trading a pair of “Hen of the Woods” for six forage sticks early on. Meanwhile, Blue picked up a couple of basket cards and couple of night cards, but was unable to get a nice set worth cooking. Red picked up a couple of Porcini cards and Blue collected a couple of Morels and both players waited for the third card to make up the set. Red cooked a handful of Tree Ears flavoured with some cider and Honey Fungi, while blue cooked some Shitake with butter and some Lawyers’ Wigs. As the supply of fungi started to dwindle, Blue finally managed to pick up the third Morel and cook it, but Red took the last pan card preventing her from playing the Chanterelles. Despite this, Blue took the game by 38 Mushroom Varietal Points to 29, giving her a hat-trick of wins for the evening. Learning Outcome: It is nice to come back from a loosing streak with a bit of a bang. This entry was posted in Games Night and tagged Agricola, Agricola: All Creatures Big and Small, Agricola: All Creatures Big and Small - More Buildings Big and Small, Morels, Sushi Draft!, Tobago on March 11, 2014 by nannyGOAT.